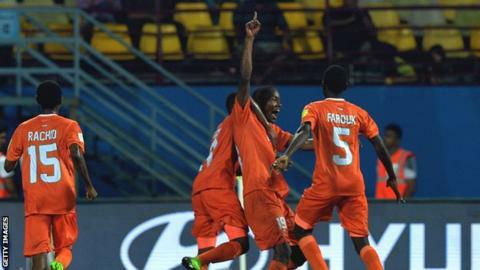 Debutants Niger made history on Saturday by winning their first match at the Under-17 World Cup in India, but Guinea were beaten in their opening group fixture. Niger were 1-0 winners over North Korea in Kochi to record a victory in their first Group D match. Salim Abdourahmane struck Niger's goal in the 59th minute to seal the win. Brazil are top of Group D after a 2-1 win over Spain. Niger will next play Spain on Tuesday. In Goa, Guinea fell to a 3-1 win to Iran in their first match of Group C.
After a tight first half, Iran raced to a 3-0 lead in the final 30 minutes of the match with goals from Allahyar Sayyad, Mohammad Sharifi and Saeid Karimi. Guinea got a consolation goal in stoppage time through Fandje Toure. Iran are top of Group C followed by Germany who beat Costa Rica 2-1. Guinea, who are bottom of the standings, face Costa Rica next on Tuesday.